EAST LANSING — And now they are champions. 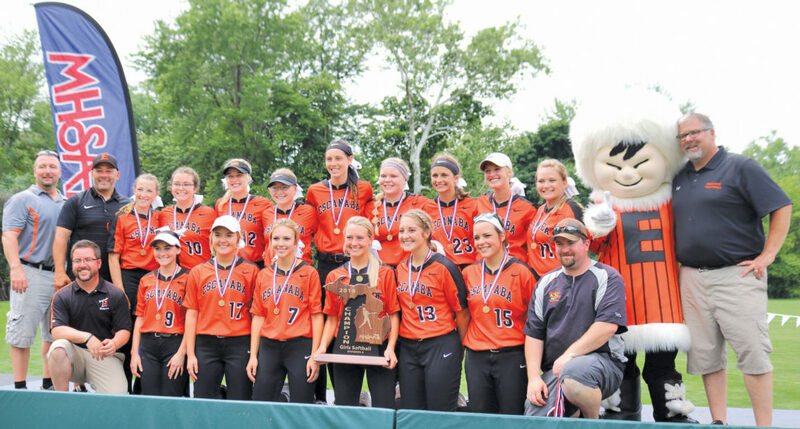 There wasn’t really much of a question, not after the Escanaba softball team scored in the first inning to give Gabi Salo the only run support she would need. The last pitch had its own bit of drama. Salo froze South Haven’s Anna Bocock with a changeup, and things came to a stop for a full second before the umpire called her out. Then again, that’s what the Eskymos have come to expect from their sophomore ace, who has committed to play at the University of Wisconsin. Salo worked on her changeup during Friday’s off day and put it to good use on Saturday. The Rams (32-9) managed only three hits off Salo and had never advanced a runner beyond second base. The game got off to an unusual start, with a rain delay that came two pitches into South Haven’s second at-bat in the top of the first inning. During the delay, which lasted about 30 minutes, the Eskymos turned on the portable speaker they had in the dugout and started dancing. The unflappable Eskymos put on “The Electric Slide,” and soon both teams were doing the line dance in their dugouts. “We started, and they followed,” Cloutier said, smiling. “We did, obviously,” she said, laughing..